Jay Harrison at work on Crane Mountain. Photos by Phil Brown. Jay Harrison lives at the base of Crane Mountain, but he probably spends more time on the mountain’s many cliffs than in his house. 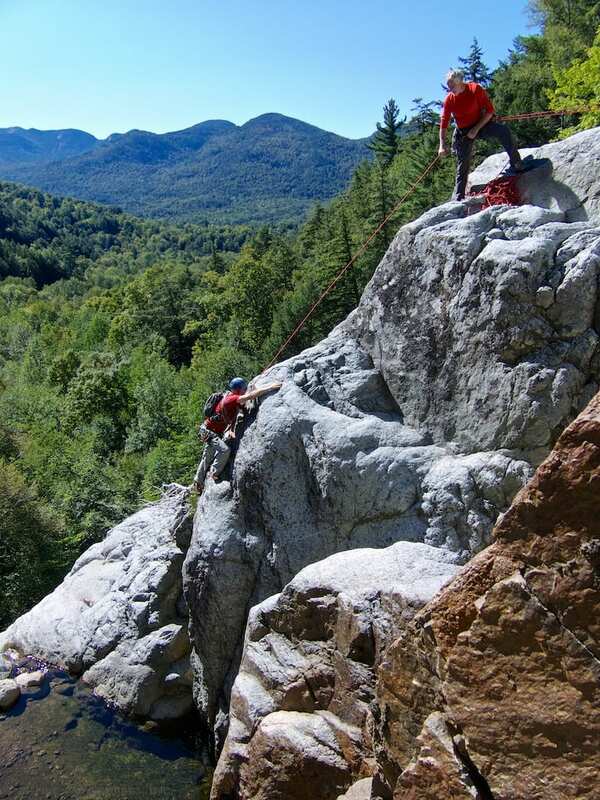 The guidebook Adirondack Rock devotes no less than seventy-three pages to the rock-climbing routes on Crane. This is thanks to Harrison, who has participated in about 350 first ascents in the Adirondacks—more than anyone else. Most of his routes are at Crane. He clearly is the king of the mountain. In 2013, veteran climber Don Mellor wrote a profile of Harrison for the Explorer. It’s well worth reading, both for Don’s writing and for understanding who Jay Harrison is. Philip Brittan starts up Stand Your Ground. Last Sunday, Philip Brittan and I climbed at Crane for the first time, with Harrison as our guide. Although Jay has been climbing at Crane since the early 1990s, he clearly was excited to show two newcomers around his favorite mountain. He took us up a stellar “linkup”—a route that combines the best pitches of two or more routes. First we ascended the first two pitches of Stairway to Heaven, both considered moderate in difficulty (5.7 on the Yosemite Decimal System scale). The highlight was pulling over a roof near the end of the second pitch. It proved to be easier than it looks, thanks to big handholds conveniently placed where you need them. Of course, when Jay first climbed the pitch in 2010, he had no way of knowing those holds were there. A view from the Jammer Wall on Crane Mountain. After the second pitch, we walked a short distance to Fireworks, another 5.7. This route has two cruxes: a hand-jam crack at the beginning and steep slab at the end. 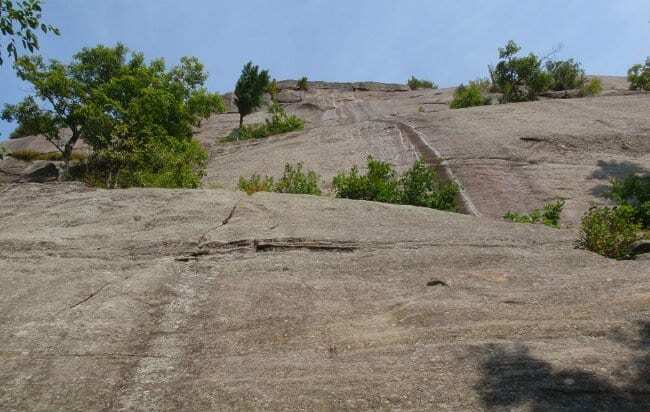 Jay and a friend put up this route on July Fourth in 2013. 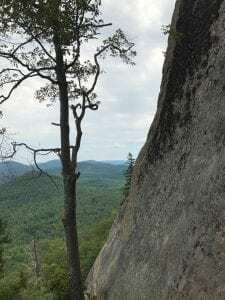 We had lunch on the ledge above this pitch, then climbed Stand Your Ground, which Adirondack Rock describes as “one of the best 5.7 routes at Crane.” It follows a large crack, but with abundant holds on either side, the crack is seldom needed for holds. To my mind, the hardest part of the route is the steep slab above the crack. Finally, we did Action Steps, a route just to the left of Stand Your Ground. 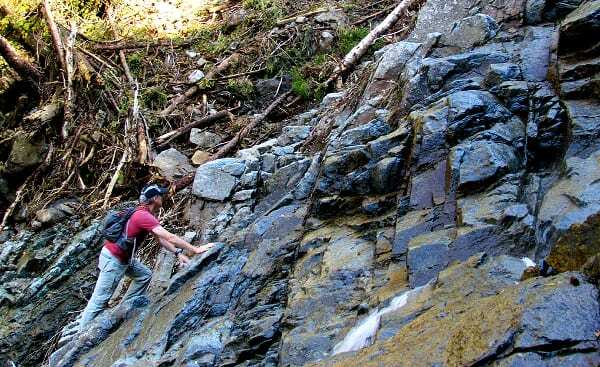 It entails ascending a somewhat steep face, often on small holds. It’s not in the book, but Jay rates it 5.8. 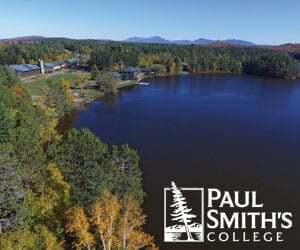 For the overall quality of the climbing, Adirondack Rock gives three stars (out of five) to Stairway to Heaven, two to Fireworks, and four to Stand Your Ground. 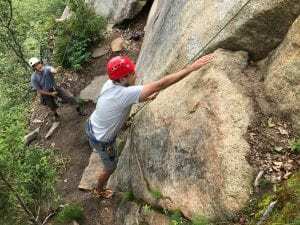 Linking the three offers a variety of climbing on clean rock. 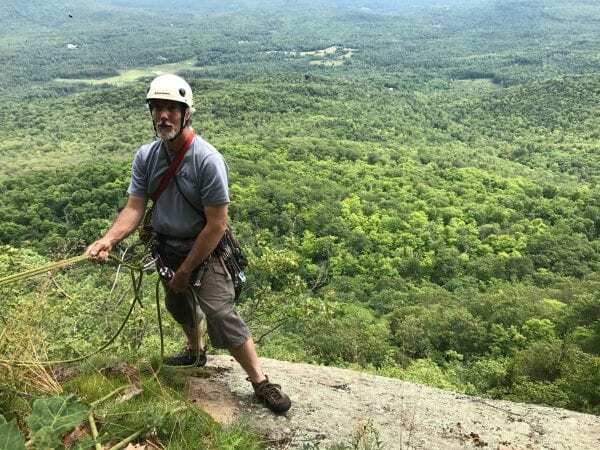 To learn more about Crane Mountain climbing and about Jay Harrison, I again encourage you to read Don Mellor’s article. Or better yet, go climbing with Jay. 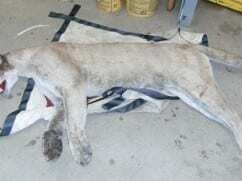 He is the owner of Mountainside Adventures.